What will future washing machines look like? The Haier Group is a leading brand of major household appliances in Asia which focuses on innovation on the major platform. Our mission was the development of an innovative user interface and user experience of a future-trended washing machine. Instead of using ‘buttons,’ we tried to create a more intuitive way of depicting data and gestures of operating washing machines. We aimed to develop a prototype with a revolutionary user experience which the machines can interact with their users. 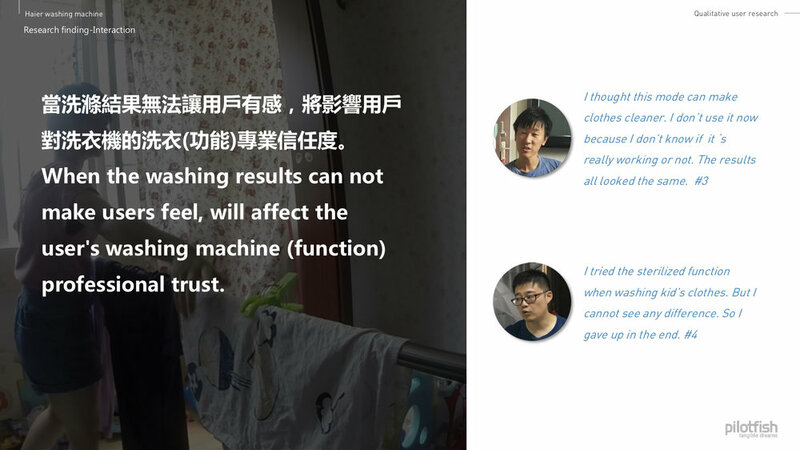 Continue Haier’s previous research, Pilotfish did not focus on the process of the washing machine. We probed into the interaction between users' behavior pattern and mental cognition. The research result was the basis of follow-up UI development. After 5-7 interviews, we concluded 4 vital keywords from target users as their cognition for Intelligence. The 4 elements user can define if this is an intelligent product. 20% of the washing machine function can meet 80% of the user's laundry needs. Currently, most of the washing machine interface on the market display all the features together. It does not follow the use scenarios to distinguish the importance. The current washing machine operations are one-way communication (input, output). In the future how to create two-way communication and improve the humanization of washing machines? In the interaction between washing machine and user, it did not bring any emotional impact. Users only treat the washing machine as a necessary functional object at home, not a humanized character. The concept should be implemented into following laundry behaviors(classify clothes is not necessary). A completed concept means the interaction concept can be fitted into every laundry phases. Based on the interview findings, we concludes some insights and incentives of the Chinese users. When you work or have a family, children, resulting in faster pace of life, you can still keep more time to do what you are interested in. How to reverse the situation. Let washing machine can adapt into the daily schedule of people. Can be assured that wash baby's clothes together with the clothes of parents. Do not worry about the bacteria on clothes of adults affect the baby's health. 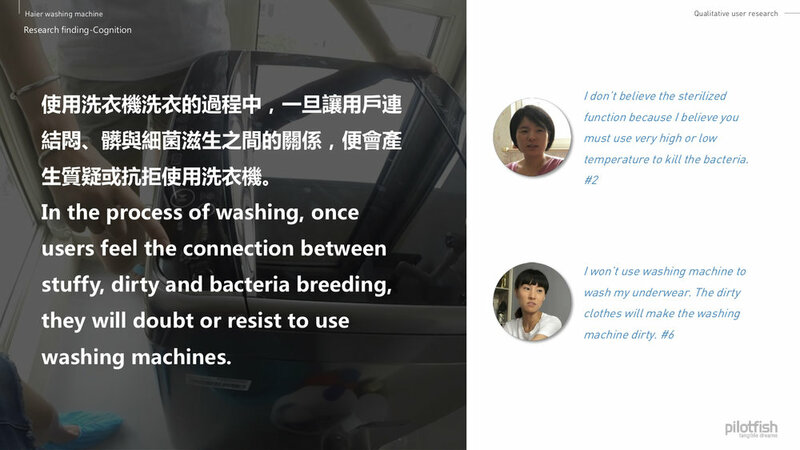 In the washing environment which is an easy formation of bacteria breeding. How to let users to be free to worry about clothing contamination by bacteria. 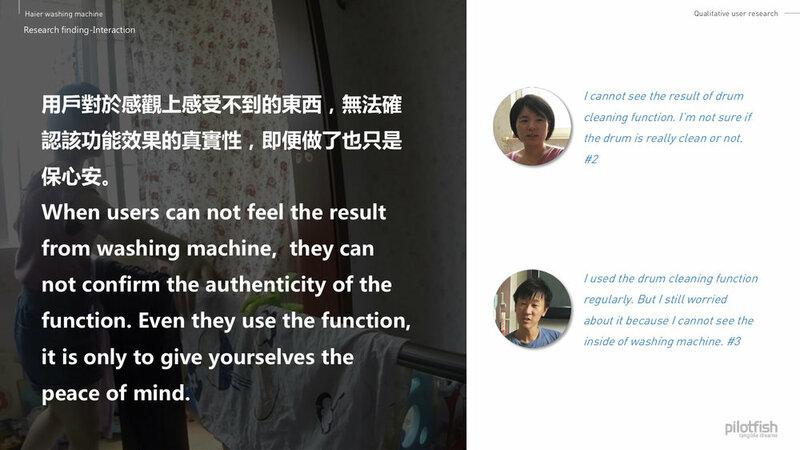 From the beginning to the end of the laundry process, how to allow users to feel the professional of washing machine? How can they clearly distinguish the differences between functions? What kind of design techniques or psychology can be used when there is a difficulty of technology implementation? How to allow users to learn the right laundry knowledge and the use of washing machines in the operating process to deepen the trust of the washing machine professional? How to balance the washing machine operating mental model between user and machine designer? So that users can learn the correct idea of laundry and use the washing machine in a right way. How to reduce the psychological concern of users for the stuffy, dirty and bacteria breeding? By holding a design workshop with designers and engineer, we used the criteria and incentives from users and tried to formulate an innovative gesture for the future washing machine and laundry process. Evaluating the feasibility for the technology in different stages. We customized a tablet which was able to apply on the board of washing machine and formulated a series of innovative gestures to operate it. The following diagrams are the user flows and wireframe of the interface. To collaborate with the panel and washing machine itself, the user interface I designed was depicted in a dark but modern way. I applied semi-flat design and graphically visualized the information. Feeling inspired? Let’s work together!